I finally finished this manga (all 25 books!) It was a lot to read, especially since I read most of it this summer (I think I had five done before that). 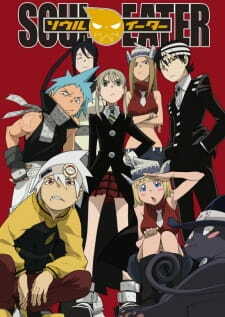 Soul Eater follows young kids as they are learning to be Meisters and Death Weapons to keep the world safe under the Shinigami. They go to school at DWMA where they learn from crazy teachers, such as Dr. Franken Stein. But when all seems fine, the Kishin is resurrected by the witch Medusa and they must put a stop to the madness that is spreading. Anyway, I loved this manga! Ōkubo did a great job tying the plot together throughout the ten years that this manga went on. Although some people think that there are different arcs, really it is one large arc with many smaller arcs. That is definitely hard to do on such a long time frame, by Ōkubo nailed it! As for the characters, I think they are all very well rounded, some of them developing throughout the manga because of the events unfolding and others not so much as developing, but are minor characters who have already become the person they are meant to be (if that makes sense). I will go into more detail below, but it will be under the *spoilers* section. The art is good, it isn’t my type of art, but it is consistent and very well done. It definitely goes with the theme throughout the manga, so the style didn’t bother me that much even though it wasn’t something I would normally look for. That is just a personal preference, so it’s nothing I would mark the series down for. And now, for the spoiler section. As for character arcs, everything that had to do with shinigami was fantastic. I wanted to punch Excalibur at the end, but it was fantastic. Having the Kishin be Kid’s brother really brought things to a close, and I felt teary-eyed when Death died. Maka and Soul had an awesome development throughout, getting through the fears and what they have faced in the past, and what they face in the present. They became strong together and they learned to fight like two badass people. I really liked when Maka fought with her father, because the connection of family, while facing Crona, bringing that development within Crona out in the open. As for Black Star, at first I really didn’t like him, but after the mini arc of him wanting to become stronger, I really started to appreciate the character. He grew up and learned what it meant to be truly a warrior. And last but not least, I really really enjoyed Stein’s progress throughout the story. He was the one most susceptible to the madness at DWMA and even though he was losing himself to the madness, his friends always stayed by his side. They never left him, even when he was young and mad, wanting to dissect everything. His friends were true, and I think that was the greatest strength that Stein had. And in the end, he was able to control his madness and use it to his advantage. Just in time too, because now he has to give up cigarettes for his new little monster. So let me know if you read it, want to read it, or have any other comments.